Brunswick - Father Mike's Dark Rich Ruby 5.80 A classic strong mild with low hop rate, full bodied sweet maltiness and a fruity, vineous finish. My score 16/20. Spectrum - Octogram 8.00 A proper old ale, black in colour full bodied with a sweetish malty initial flavour, becoming more tart towards the finish. My score 16/20. Adur - Merry Andrew 6.20 Striong dark mild style ale with good malt character, full body and a slightly hoppy finish. my score 16/20. Derventio - Lucretius 5.50 A cherry stout with a good strong cherry fruit flavour that doesn't overpower the roast malt flavours of the stout. Score 16/20. Shardlow - 5 Bells 5.00 Dark brown strong mild style ale with good malt character and some fruitiness in the finish. My score 15/20. Wolf - Timber Wolf (superseded by 5.2% version) 5.80 Now shown as 5.2%, this is a red/brown bitter with a malty bitterness and some hoppiness in the finish. My score 15/20. Leatherbritches - Winter Warmer 5.50 A good solid dark brown sweetish winter ale with good balance of malt and hop. My score 15/20. Three B's - Shuttle Ale 5.20 Amber strong bitter with dryish hop bitterness and not much malt character. My score 14/20. Coastal - Erosion 7.50 Dark brown in colour, quite bitter with a dryish appley taste. Something lacking for a beer of this strength. My score 14/20. Darwin - Rolling Hitch 5.20 Quite bitter, but without any strong hop or malt flavours. Slight hint of mustiness. My score 14/20. Wantsum - Ravening Wolf 5.90 A hoppy strong bitter with the characteristic piney hop flavour that is not to my taste. My score 13/20. Spectrum - Octogram 8.00 My beer of the festival. Slight sourness good dark fruits. Ashover - Rattle Imperial Red 7.50 A little cheesy on the intense American hops. Good strong amber ale though. Beeston - Norfolk Black 6.00 Some liquorice and some fish oil, but great condition and I liked it. Wolf - Timber Wolf (superseded by 5.2% version) 5.80 Deep ruby colour. With lasting bubbly beige head. Some roast. Some juicy malt even a touch of smoke. Decent strong beer with some jammy fruit some ripe strawberry jam. Yes the fruit is good. Milton - Cyclops 5.30 I like Milton, but this didn't start well but then got better and the dark fruits of black cherry, plum and blackberry came through. Adur - Merry Andrew 6.20 Syrupy strong ale with a bit of liquorice. I quite liked it. Derventio - Lucretius 5.50 No brewing or serving faults and the cherry aroma is ok, but I found it hard to take even a second mouth full. Got here with Martin at opening. Nice to see Ian, Brian and Pete as well as Chris and Blair. Having not been drinking for about 2 weeks the few halves I had took their toll. I left at 4pm and it was already 1 in 1 out on the door! Goacher's - 1066 Old Ale 6.70 Smooth, alcoholic, hint of sourness, hint of smoke. A "Box of Delights" beer. Spectrum - Octogram 8.00 Black, vinous, slightly sour, mild, milky. Green Jack - Gone Fishing E.S.B. 5.50 Dark copper brown. Light metallic mandarin. Elizabethan. Slightly syrupy. No real condition though. Goacher's - Old Imperial 5.60 A brewery blend of Goacher's Old and Crown Imperial Stout. Black roasted, acrid, powdery. Wantsum - Ravening Wolf 5.90 Light, sweet, acrid, tart bite. Darwin - Rolling Hitch 5.20 Recommended by the "team" at my table but terrible beer. Buttery mess. 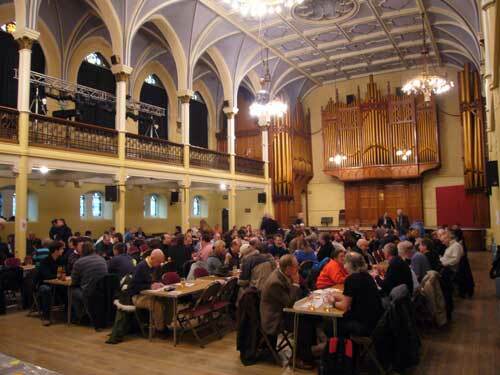 Another fantastic day at the Dover beer festival. Managed to pace myself pretty well this year, which is definitely a first. The atmosphere was fantastic and I ended up chatting to countless random people as the night wore on. It did feel quieter than in previous years, especially towards the end of the night. 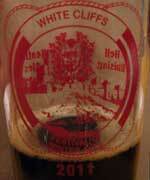 Ramsgate Brewery (Gadds') - Black Pearl Oyster Stout 6.20 Turned out to be my beer of the festival. Much improved from previous years, incredibly rich and full of flavour. In stunning condition as well, pretty much perfect. Elland - 1872 Porter 6.50 I think this is the same beer as what used to be made by Eastwood & Sanders. Tasted just as good, thick and rich with lots of chocolate, roasted malt and fruit. Brilliant. Sarah Hughes - Dark Ruby 6.00 Shame I had this towards the end of the night so I don't remember too much about it. Do remember thoroughly enjoying it though. Westerham - Double Stout 5.50 Thick and slightly tart stout. Lovely. Amber Ales - Imperial IPA 6.50 Great strong, hoppy IPA. Recommended by a bloke at my table. Pitfield's - 1792 Imperial Stout 9.30 To be honest, at 9.3% I would have expected a lot stronger flavours. Pretty subtle and quite tasty, certainly didn't taste it's strength. Black Country - English Winter 5.50 Recommended by the fella serving, slightly watery but still had decent flavours of chocolate and fruit. Goacher's - Old Imperial 5.60 I was expecting a little more from this but it was still nice enough. Flavour seemed dominated by the barrel it had come out of but there was a bit of roasted malt and fruit in there. Beowulf - IPA 7.20 To start with this was fantastic, a powerful, hoppy IPA. However, it was a little sweet and it became almost too much by the end. Broughton - Old Jock 6.70 One of the beers I most looked forward to. Big disappointment. Very sour with little flavour I could detect, I had to donate it to the slops bucket in the end. The pub is found in Dover, Kent, CT16 1DL. 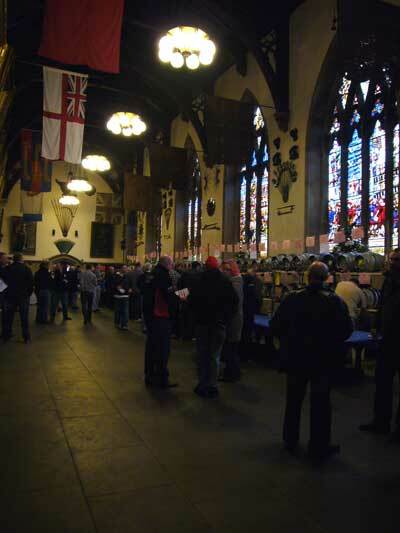 The Dover Beer Festival of Winter Ales in the superb venue of the Maison Dieu Town Hall. We have visited this pub 4 times, seen 28 different beers and tried them all.